A cuddly toy of your penguin just like Monty! A factbook all about the Adélie penguin along with bookmarks and stickers too. Two exclusive magazines: WWF’s ‘Wild World’ and ‘My Penguin’ with news and updates for your adopted animal. Penguins are really social animal that loves to be around friends and family all the time, sometimes in groups of 200,00! They are always looking for that special someone in their life, and when they find them, they stay together for life. Penguins believe in sexual equality, and the men love to play househusband. They will incubate the eggs whilst their wife is off looking for food. 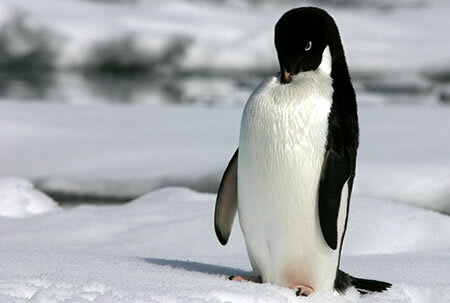 There has been a 65% reduction in the number of Adélie penguins in the last 25 years. 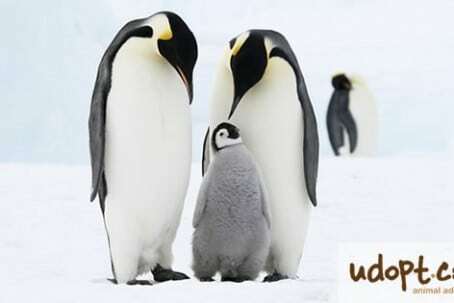 Your donation will help WWF to stop illegal fishing in the area and help build marine protected areas in the Antarctic to stop the decline in penguin numbers. Penguin’s used to be able to fly millions of years ago, but now they specialise in swimming and diving. They are fastest swimmers and deepest divers of any bird on the planet. A penguins eyesight is far better underwater than it is on land, which is helpful when they go diving for food. They spend at least 75% of their life at sea, and can live up to 30 years old. They don’t drink water, but they love to eat snow, which is good as there is plenty of that around where they live! The Adélie is the smallest of the Antarctic penguins, but their babies grow the fastest. I may be as cute as a button and lots of fun to watch as I race around and slide on my belly, but my numbers are dropping at a rapid rate. Over half of my numbers have decreased in the last 25 years due to global warming and illegal fishing, so I need your help to survive. Please sponsor me today to help WWF protect my habitat and reduce the numbers of fisherman that come into my home. We might only be small but we need somewhere to live and play too, and if you could help that would be very welcome. Living in some of the most inhospitable places on earth, endangered penguins are well adapted for life in the forbidding Antarctic climate. Although some smaller varieties of penguin live near temperate and even equatorial shores, they only do this in places that are cooled by Antarctic Ocean currents. The penguin spends most of its time in the ocean where it hunts for krill, fish, squid and crabs. As they hunt, they are at risk from deep sea predators such as seals, sharks and killer whales. The black and white colouring on the penguin’s feathers provides camouflage that makes it hard to see a swimming penguin. The penguin’s slick feathers maintain an insulating layer of air that keeps the body warm and provides buoyancy in the water. Penguins are excellent swimmers and although they cannot fly, they swim with the grace and agility that other birds show in flight. Penguins will dive to great depths of more than a quarter of a mile in their hunt for food, and may dive more than four hundred times in a single day. During a single hunting session the penguin can swim more than one hundred and eighty miles. On land, penguins build nests from rocks and stones. They usually lay their eggs in pairs, although the emperor penguin will lay only a single egg. Mated couples stay together for the entire breeding season and take turns hunting and keeping the eggs warm. The exception is again the emperor penguin. Immediately after laying her egg, the female emperor penguin will leave the male to tend to the egg and she will go hunting for up to two months. She returns to the nest when the chicks have hatched and regurgitates food for them to eat. She then stays with the chicks while the male goes hunting. When a penguin mother loses a chick she will try to steal another bird’s child. The other penguins will assist the real mother and help her drive the interloper away. 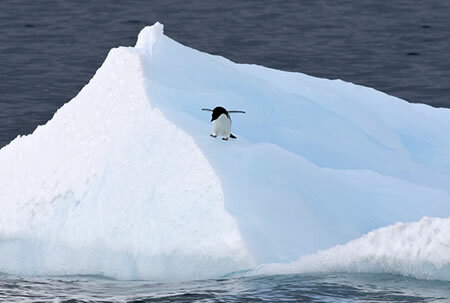 In spring, penguins must travel from their nests to the open ocean before the ice breaks up. 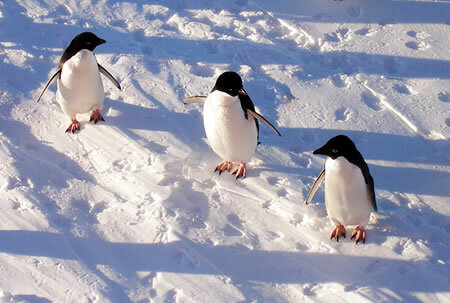 Despite their short legs, the penguins have no difficulty walking over thirty miles to get to the ocean. Penguins are very cooperative birds. They group together to share warmth and to protect each other from the wind and cold. The penguins act cooperatively to take turns being on the inside of the group where they stay warm. This is how penguins spend the long Antarctic winter on the open ice. The way I wander around on the ice, you probably think of me as being a bit clumsy and awkward. But I’m not. Get me in the water and I’m a world class athlete. I dive better than any other bird and can go down as far as a quarter of a mile. I can hold my breath for twenty minutes while chasing fish. I can swim pretty fast too. Some of my penguin friends can swim at up to 20 miles per hour. Even on land, I’m pretty good at getting around. Sometimes I walk thirty miles just to get to my nest. That’s pretty far on short legs. When I really want to get somewhere fast, I take a giant leap and flop onto my belly. Then I skid along the snow on my belly really fast. You call it tobogganing, and I call it fun! I drink ocean water and it is very salty. All that salt isn’t good for me so I have a filter in my nose that actually takes the salt out of my blood. All that extra salt runs out of my nose and gets washed away in the ocean. I’m going to lay an egg soon. My mate and I have already made a nest out of rocks. After I lay the egg, my mate will have to take care of it. In fact, my mate might go several weeks without eating while he just sits there looking after the egg. While I’m gone, I’m going to eat as much food as I can get. Then I’ll come back just after the chick hatches and I’m going to be sick all over my mate’s feet – I bet you think that’s pretty gross. Well, that’s the best food for a baby penguin so that’s what we do. After that, I’ll stay with my chick and their dad can go hunting for his food. I know we are cute, and after Happy Feet, a lot of you want a pet penguin, but it’s not a good idea. I need lots of space and cold water for swimming and hunting. We also need to be around other penguins. A pet penguin just won’t feel as happy in your home as it would in its natural environment. What you can do is adopt a penguin with a charity. That doesn’t mean you get to take one home. It’s a way to sponsor a penguin in the wild. Endangered penguins are at risk because global warming is melting the ice where we live. When you adopt a penguin, you help to protect our habitat and nesting grounds by sending us gifts each month, which we really appreciate. The world’s penguin population is being challenged in numbers by changes in climatic conditions and the affects these are having on the place they call home. Additionally humans are also playing a part through the harvesting of krill and fish from the Antarctic seas, which are reducing the stocks of food that penguin populations need to survive. Many of the penguin species are under threat of extinction. Penguins are uniquely adapted to the Antarctic environment. As the oceans are warming up, the delicate balance of their ecosystem is being destroyed. Climate change seems to be having the greatest effect on the earth’s Polar Regions. In parts of Antarctica, the average temperature has increased by three degrees in the past fifty years. Sea ice is melting because of the warmer temperatures and penguin nesting grounds are getting smaller. As the Antarctic ice sheets melt, large sections are breaking off into the ocean and disappearing. This moves the shoreline closer to the penguin’s nesting grounds. Because temperatures are warming earlier in the spring and the penguins have a shorter distance to their nesting grounds, they are starting to nest too early. This disrupts the timing of their breeding cycle. Scientists are concerned that nesting will occur too soon, and that this will result in chicks leaving the nest and going to the ocean too early in the season. Upsetting the delicate balance between their breeding cycle and the availability of food in their ecosystem leaves penguins vulnerable to the health effects that come from a changed diet. Humans have begun harvesting krill and fish from the Antarctic seas. Several large trawling operations have moved into penguin habitats. These industrial scaled fishing platforms are removing all of the krill and fish from the areas where they operate. Penguins are losing the competition for food. The greatest risk for penguins is at the end of their breeding cycle, when they return to the ocean to replenish after weeks of not eating. Weakened, they are more susceptible to predators as they have to swim farther in search of food. Conservation groups are working to limit fishing in penguin feeding areas. They are also educating the public about global warming and reducing pollution. Stabilising the penguin’s ecosystem is necessary to their survival. If you decide to sponsor a penguin, you are in-fact providing financial support to the habitat the conservation programs seek to protect. 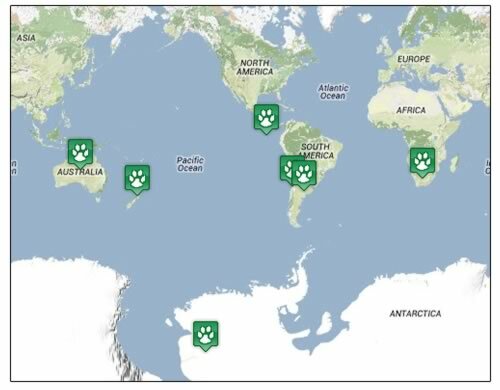 he penguin population can be found predominantly in Antarctica, but other countries also have populations of Penguins which can be seen on the map.